This is an optional RPM Hybrid Gearbox Housing and Rear Mount Kit, and is intended for use with the Traxxas Slash, Stampede, e-Rustler and Bandit 1/10 scale vehicles. 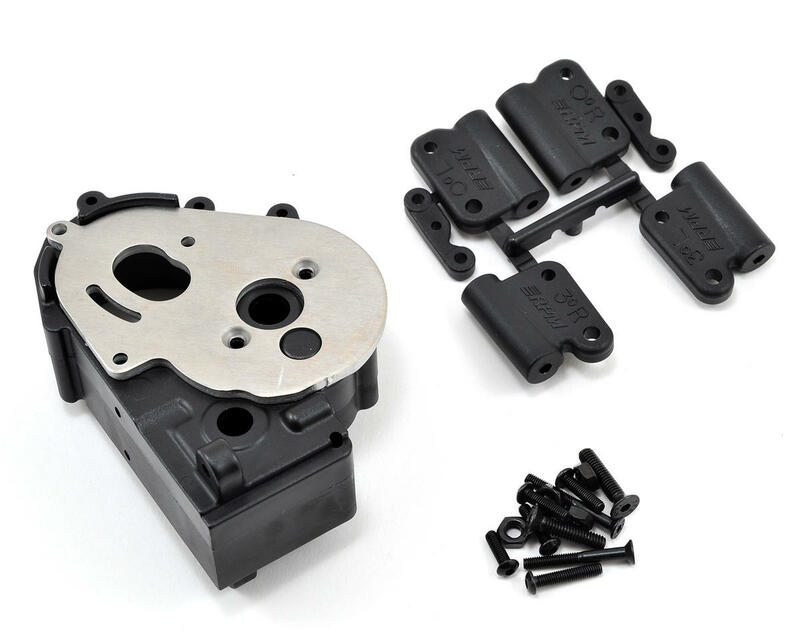 The RPM Hybrid Gearbox Housing and Rear Mounts for Traxxas 2WD vehicles is designed to solve a multitude of issues with stock and other aftermarket transmission housings. This RPM gearbox housing and mounts are a blend of aluminum and molded nylon parts for the perfect combination of strength, durability and heat dissipation. Each RPM Gearbox Housing kit is available in black, green or blue and comes will all necessary mounting hardware and instructions. 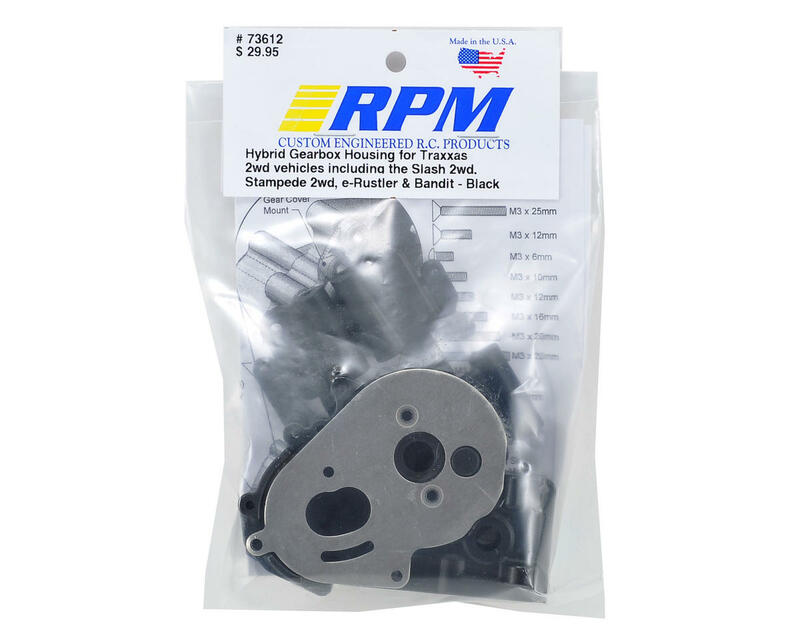 Whether racing or bashing, the RPM Gearbox Housing is one of the least expensive yet most valuable options you can buy! Every RPM Gearbox Housing kit is proudly designed and manufactured in the USA! Not integrated with the rear bumper mounts, meaning rear impacts will not bend the motor plate, (when used with a rear bumper or bumper mounting system such as RPM80902 or RPM80905). RPM modified their housing to eliminate the huge bottom hole in the stock housing, keeping your internal gears cleaner, longer. Sold with two sets of rear mounts in each package – 0° and 3° rear mounts are included. Would highly recommend. This case takes a beating. It is also easy to take apart to replace parts inside. Have had it apart for several drive gear replacements, and have no complaints. there are better....over all it is a good case. and I like the case. but there are fitment issues with these cases and 2wd stampede's. but nothing a little sand paper or a hobby knife cant fix. Great gearbox. The aluminum motor plate gives much more heat dispersion than stock. Running this in Project 70 race truck, and it has already won a 1st. You get what you pay for. Recommend! Two weeks in and still running strong. Jam nuts can be a pain and it should include ALL necessary screws but it doesn't. Holding up very nice against my bashing and 3 to 5+ foot drops will up date this when I find a way to nuke it. Nice case. Take the time to read the instructions when assembling this case, more/better pictures would have been more beneficial. I've rebuilt by gearbox several times in the past, so it wasn't too bad. The hardest parts were making sure the correct length screws are used (Note: the screw diagram on the instructions is not true to scale, use a ruler/caliper) and putting on the "jamb nuts" to secure the four 4mm bolts that hold down the rear mounts/gearbox. Overall build quality is very good and everything fit very well. It's felt a little heavier than stock case (due to aluminum plate) but definately lighter that a full aluminum case. Outside of some test runs inside the house, I have not raced with this new setup yet. We'll see how durable the case is. Great case if you want to break gears every run metal gears to . The case flexes and breaks the idler gear then the rest . I mean rpms a good brand but why do we need flex in a transmission case we need quality in the case . Only get if you want to use more money into gears than what the case even costed . Don’t get this I’m switching out ASAP. Just bought it and rite out of the package my stock gear cover don't fit. Will update when I get it on and working.